Last week someone asked me what I thought of a dark gray cabinet for a kitchen. My response was probably not popular. I said “it sounds like a good way to date a kitchen”. By that I mean that gray everything is going to be to this decade what mauve was to the 90’s. Kitchens and bathrooms are expensive to remodel. Building suppliers/designers are constantly pushing “new products” to get us to gut these rooms. There are timeless styles, timeless designs. So before you redo your bathroom, read this article and save yourself from having to redesign in five years. When we talk about any space in the home, we need to consider how we want the space to feel. I tend to like my bathroom to feel a little sterile because, the bathroom is about personal hygiene. Other words you might associate with the bathroom would be warm, luxurious, light, beautiful, tranquil or bold. It really depends on who you are. Before designing your bathroom find your word. What does your bathroom feel like in one word? 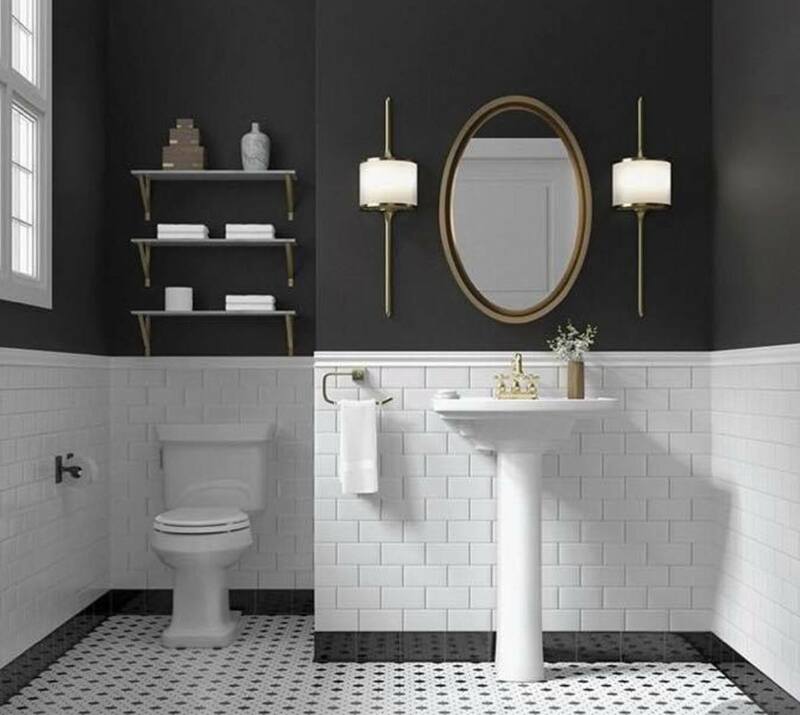 Probably the easiest way to discover your design style is to go on line and collect a group of pictures of other bathrooms to see what suits you. Pick out specific details that you like. Is is the fixtures, the tile, or is it the shower? Make notes of what you like. go to showrooms and look, collect samples. Make sure the reason you like those rooms is not an architectural feature your home does not possess. What are the architectural features that you want? The closer you get to your ideal bathroom the happier you will be with the result. Let’s start with bold color tile (Picture 1). 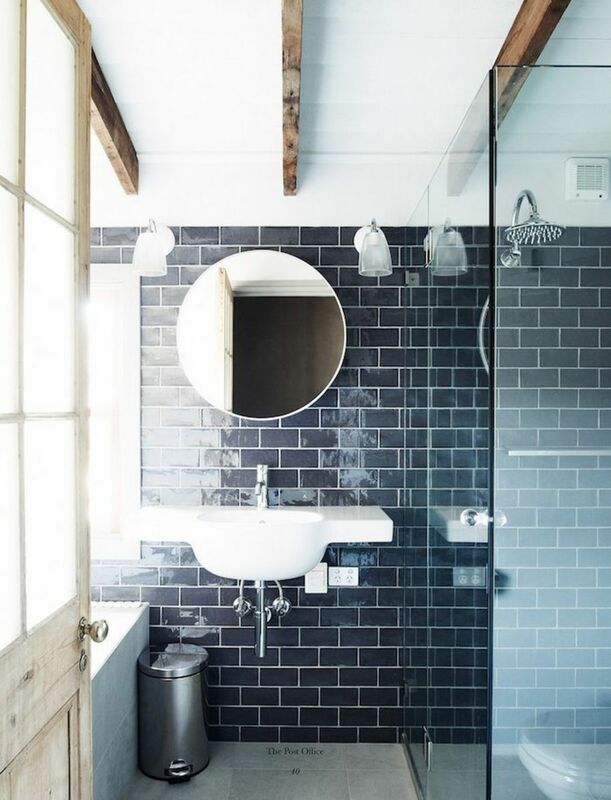 You are a fun person, you don't want an average bathroom so you are considering a bold tile color. Bold colors of today are a huge mistake. We see in picture 1 that bold color sounds fun and date your bathroom design. From the 1920's to the 1950's bathrooms went from utilitarian to design magnets. 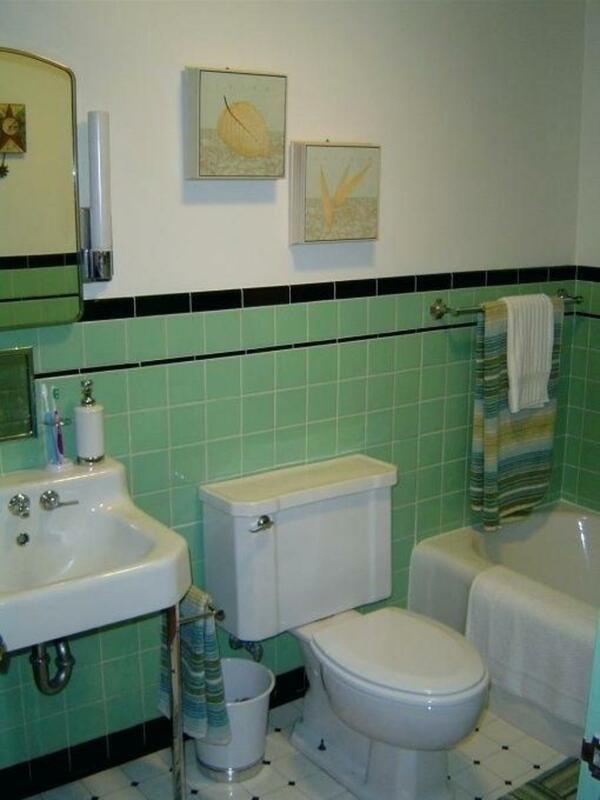 What was previously simple was given a cheery push with tons of colored tile. When the country is facing hard financial times we see bold colors become a staple of design.This green bathroom was all the rage in it's day. Today this bathroom is impractical for how we live and the tiles date it back to the 1920's. 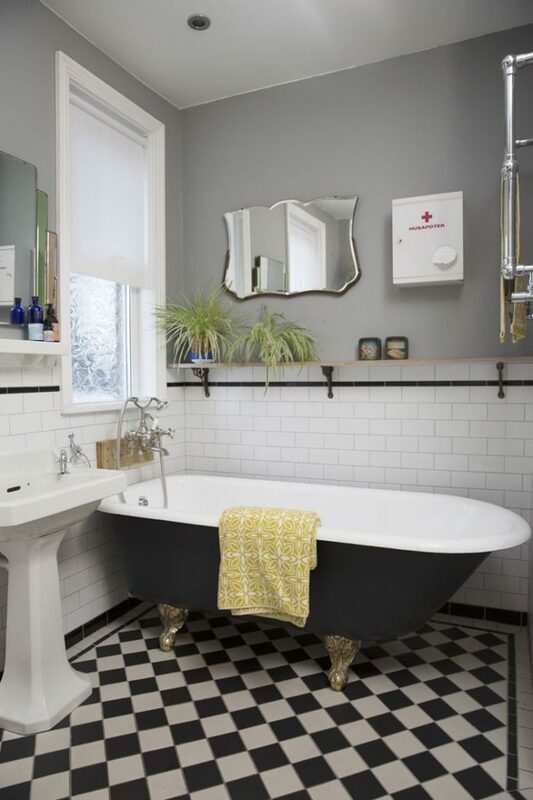 Picture 2 shows us a great updated bathroom where they chose navy blue tiles. Right now this looks like a great bathroom. It wont take long for that blue subway tile to look dated. The point of a remodel is to make a space functional and pleasing to the eye. Most people who choose bold color tile, live to regret it. The bathroom is one of the most expensive rooms in your home. The reality is that we do not spend a lot of time in the bathroom.You are in and out of that room with purpose. Your bold bathroom choices should be in paint and accessories, not in tile. Trendy Pattern Tile- It's a Trap! 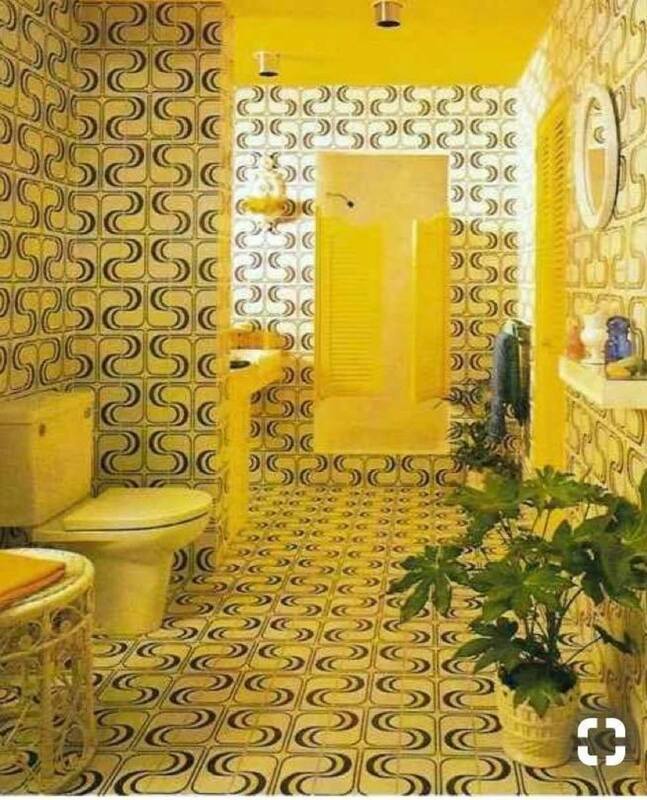 Picture 3 is an opportunity for us to reflect on the decorating sins of the generations before us.This was a super cool yellow bathroom in the 1960’s. Today it’s a decorating nightmare. 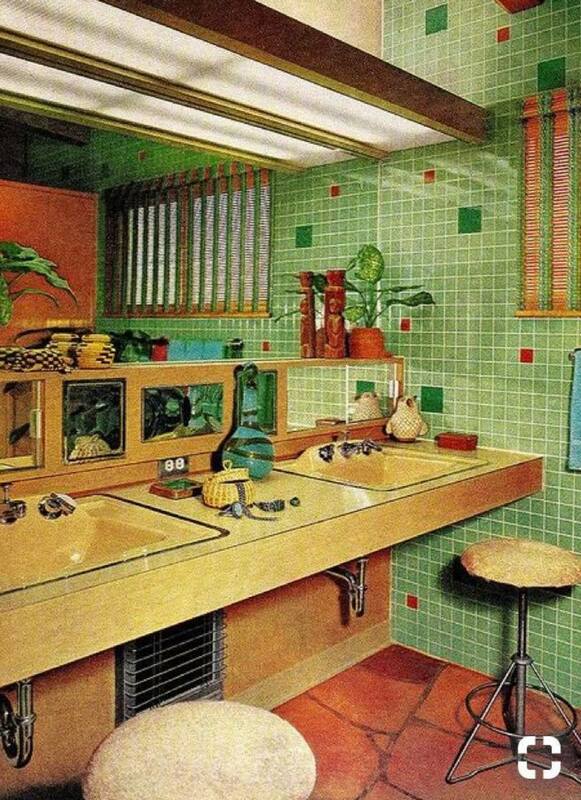 It's not just the fact that they put this tile on every surface, its that this fun house bathroom is so design specific that only three people in the world ever appreciated it's vibe. Horrendous is the word I would use. It looks like Starsky and Hutch had a baby and its name is yellow nightmare. I showed you this picture to prove a point about pattern tile. Pattern tile is always short lived in the design world. There is part of me that would love a Mexican style Talavera bathroom. I suppress the urge and buy Talavera pottery that can be switched out if I get tired of it. 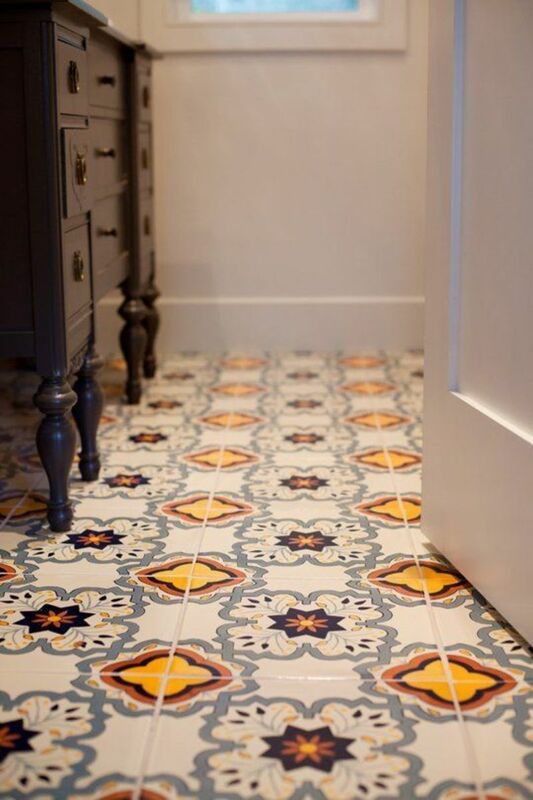 Picture 4 is a trendy pattern bathroom floor. I'm not going to lie, I like it. However, I also know that this pattern floor is going to age like day old bread. Floors are expensive to replace. If you insist on a pattern tile, keep it black and white. Know that any patterned floor is going to feel old in five years. If you are ok with changing your floor every five years, then go for it. Be aware one day in the not too distant future you will hate that tile. Picture 5 was a high end bathroom during the 60's and 70's. That tiny green tile was all the rage, until it was a rage to clean. Before you choose surfaces in your home think carefully about how you are going to clean them. The more grout you have to clean... the more grout you have to clean. Yes they seal the grout, but if you have hard water you will instantly regret this decision and no amount of sealer is going to fix it. Picture 6 is the updated grout nightmare. Can we be honest that this much tiny tile is busy. It doesn't lend it's self to a tranquil feeling even though its a neutral color. Plus these sheets of glass/stone tiles are expensive. You would think for what it costs to use these tiles that you would get a higher end look. Instead we have something that resembles oatmeal. 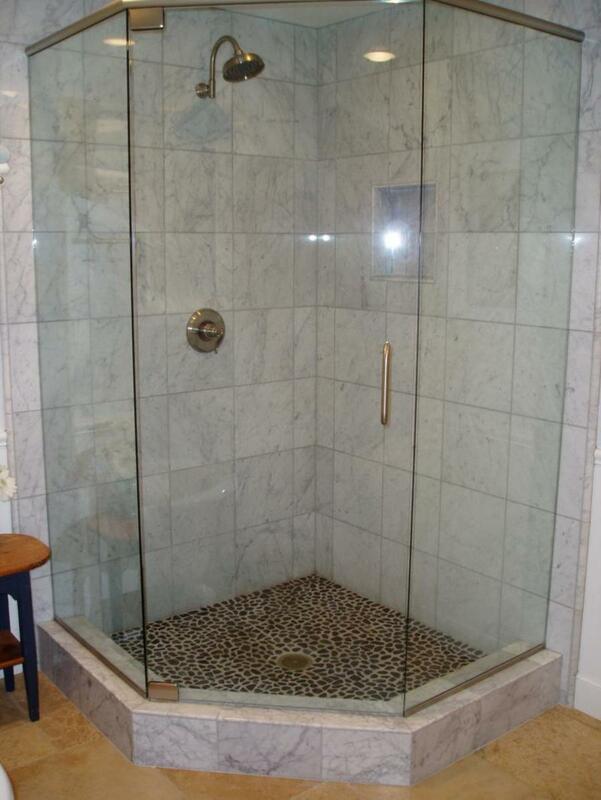 Use busy tile for details and the floor of the shower. Think about the cost and the cleaning. Pass on the busy tile. Picture 7 is an 1800’s era bathroom, today. It’s 100+ years old and still works. I’m not excited about the wall paper but, that is an easy fix. 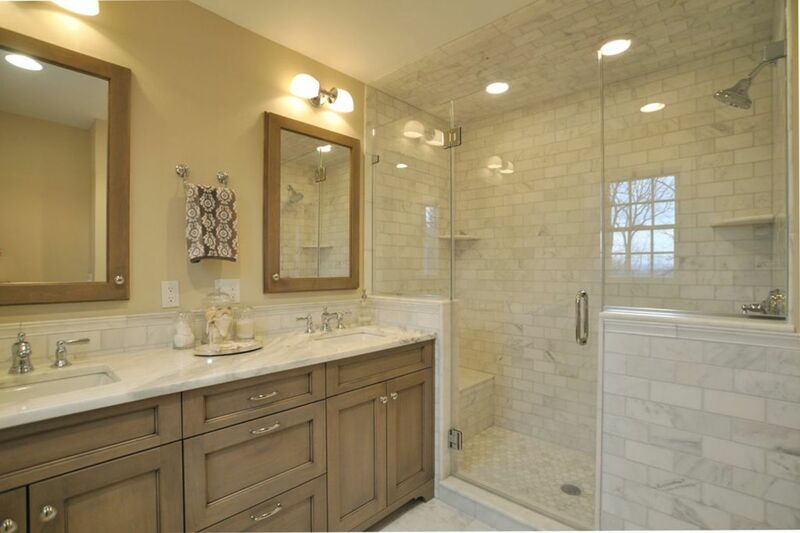 When you look at the basic elements of this bathroom they are durable, cleanable, and functional. I admit that pedestal sinks are not my favorite, it still works design wise in the room. Picture 8 is an even older bathroom. 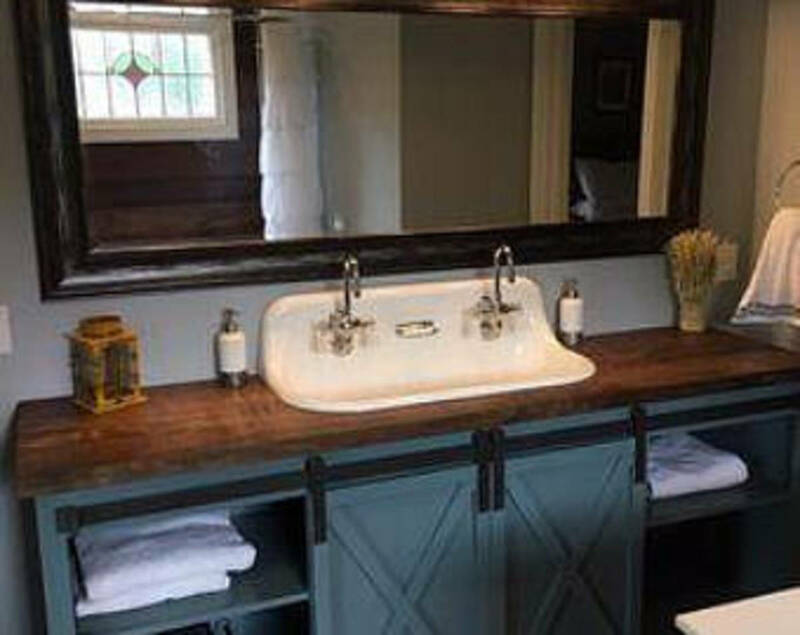 Yes that’s a rusty tub, however here again we see that white fixtures hold up over time. With minimal updating this bathroom could be right out of the show Fixer upper. 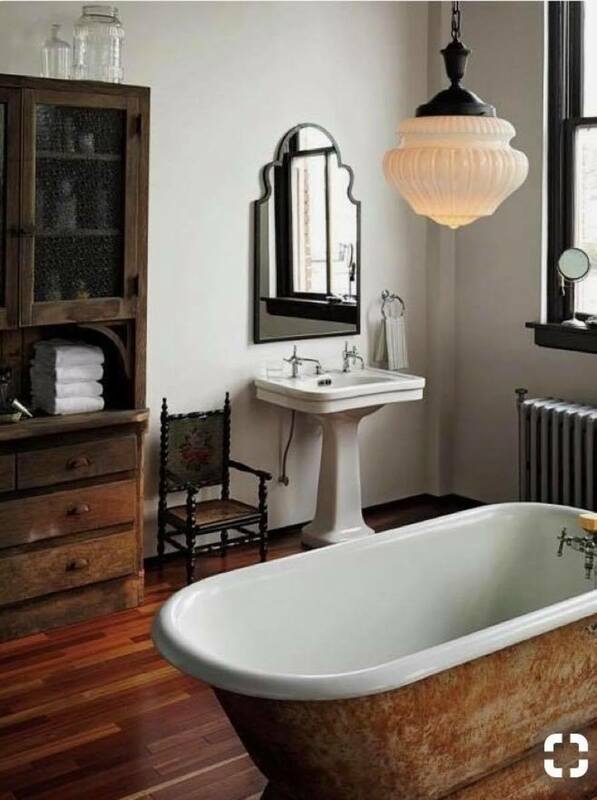 This bathroom is true to it's homes character yet the neutral fixtures are timeless. Picture 9 is an updated Victorian bathroom. They brought in the gray paint to give it a cleaner look. They also added a shelf that gives the room more storage without detracting from it's history. In pictures 10 and 11 we see bathrooms that have the white fixtures and tile. You could change the look of these bathrooms by painting the walls.These people are not going to remodel next year. I know what you are thinking, but its boring white. You could spice up either of these bathrooms with bold colored walls. Paint is cheap. Re-tiling your bathroom is expensive. Picture 11 also shows a design option that we should all take notice of when remodeling, hiding the toilet. Walking into a bathroom the first thing you see shouldn't be the toilet. Hiding the toilet on the other side of the vanity is one way to obstruct the immediate view of the toilet. When you walk into your bathroom what do you want to see? What’s going to hold up over time? Walk in showers. 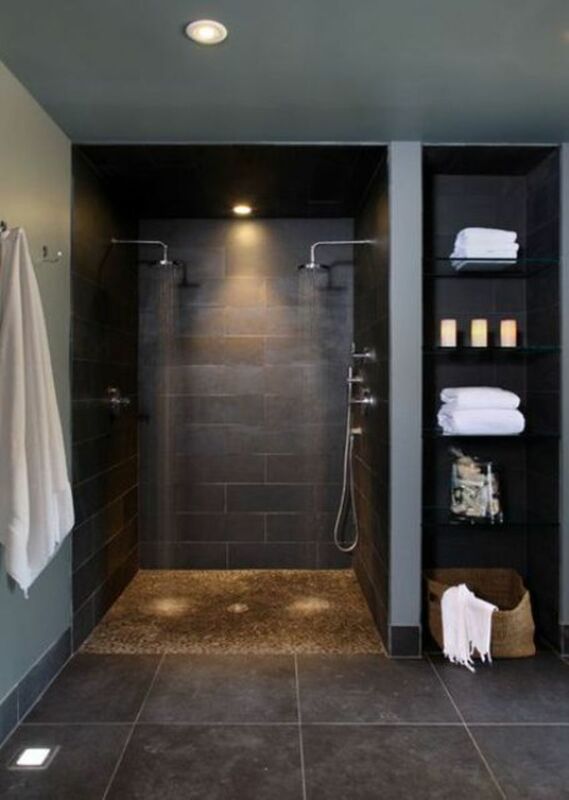 I hate glass block walls but, walk in showers are easy care and lend themselves to our busy lives. Also this tile isn’t going anywhere. 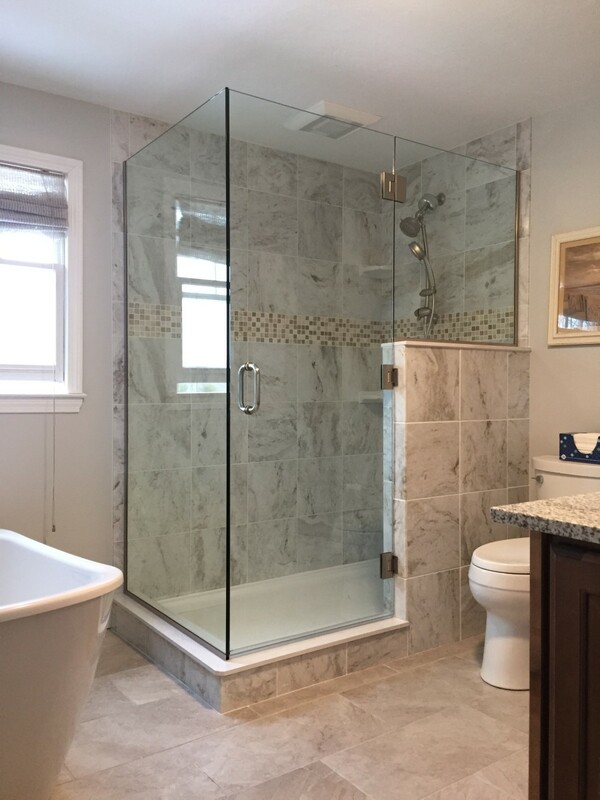 Choosing durable materials for their practicality means when you sell the house, you won't have to gut the bathroom first. This bathrooms attitude could easily change with some painted walls and a change in fixtures. These tiles may not even be a natural stone. This is the spa look and it works. Notice the shower pan? Yep that is a fiberglass shower pan. The advantage of using a fiberglass shower pan is that it will always drain properly. The reality of tiling a shower floor is that floors shift. Right now I have a marble tile shower floor that is not draining properly because the dirt under the house has shifted. Consider how your home will settle. If an uneven floor is in your future, go with the fiberglass shower pan. Plus lets be honest, in terms of cleaning that shower pan is a foam spray away from looking brand new all the time. One more thing about this bathroom, they continued the cleanable surface around to the toilet area. See how the outside wall is tile. For those of you living with men, walls around the toilet need to be easy clean. That tile will be easy to keep clean. Part of me knows that regular drywall is not coming clean. 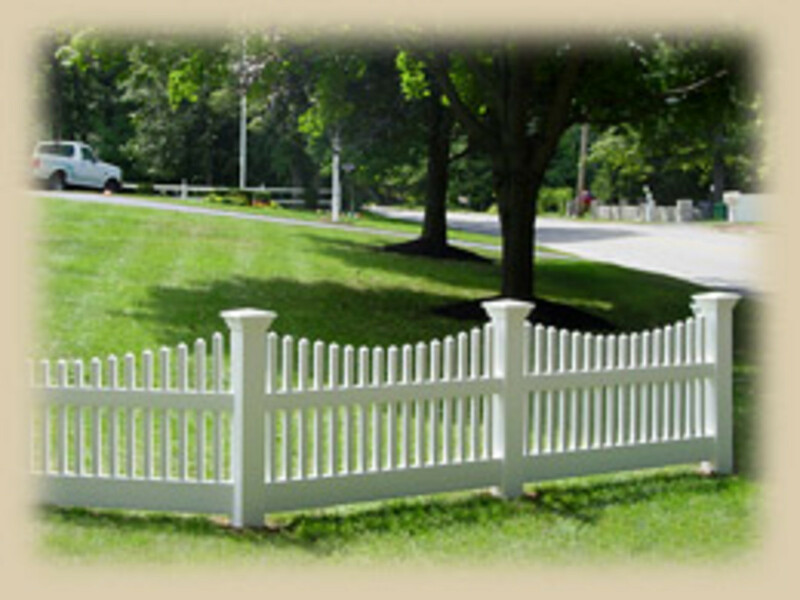 Remodeling gives you the opportunity to solve problems. 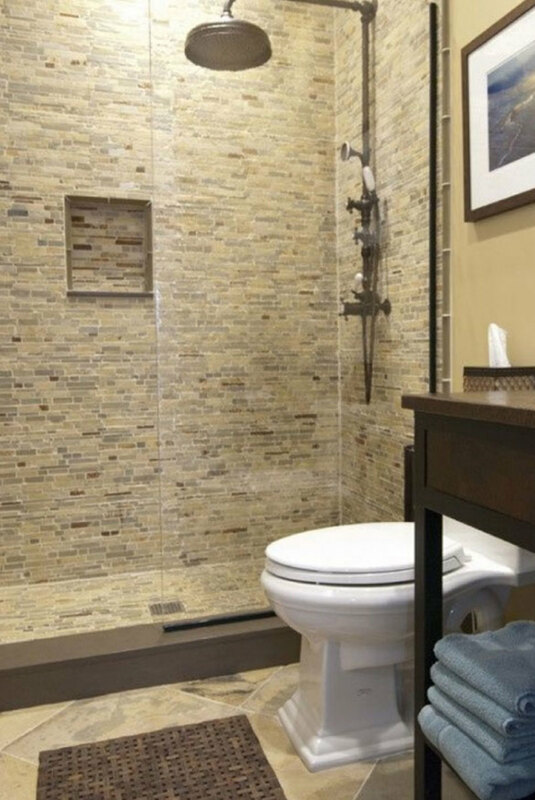 List issues with your current bathroom situation and find practical solutions. We have all heard the term "Smoke and Mirrors" it's a magic reference to fooling the eye. 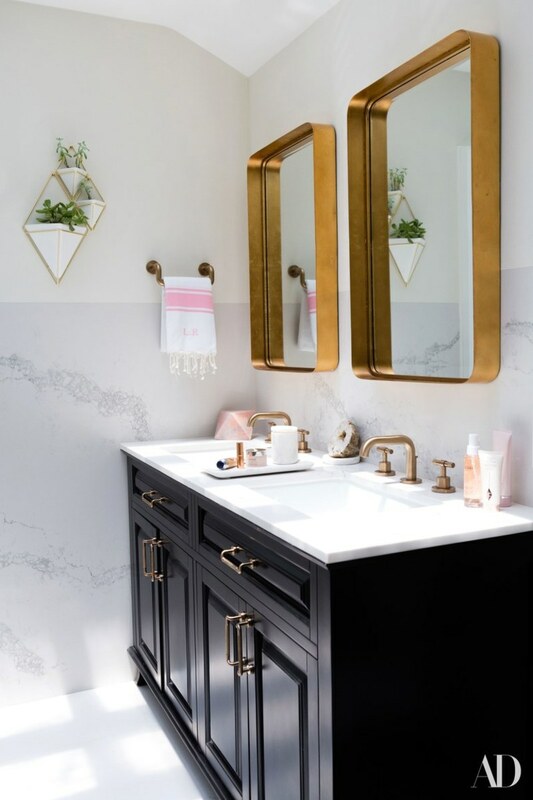 Mirrors and fixtures are the jewelry of a bathroom. The great thing about mirrors is that the possibilities are endless. In choosing a mirror you have to get the right scale. The mirrors should leave enough room at the top for your lighting to be 5-6 inches above the mirror. Also your mirror should center with the sink and be wide enough to see your torso. If you buy a mirror that is too tall or too small it will detract from the beauty of your room. You can choose any mirror style. 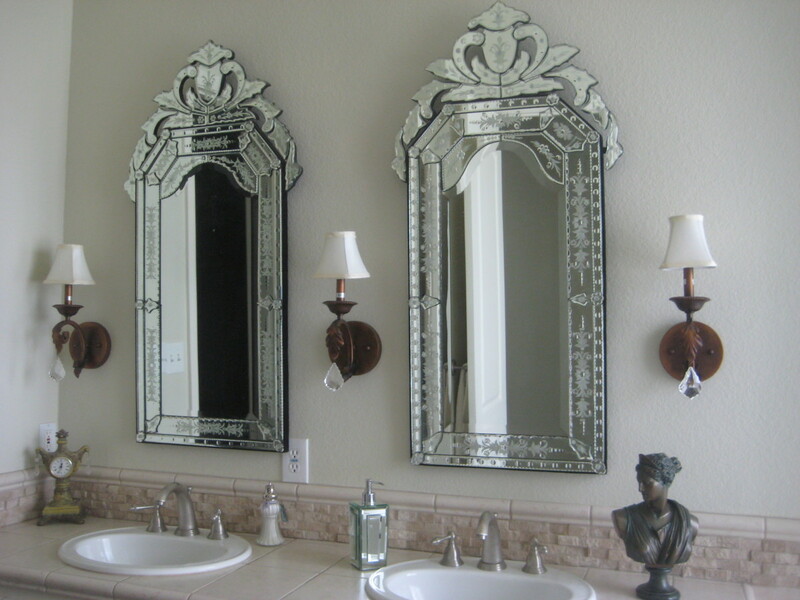 Consider looking for mirrors in antique stores or trade catalogs. This is an opportunity to be different without going broke. Choosing a vanity is one of the more expensive bathroom decisions. Consider what you store in your bathroom. Do you need lots of drawer space? Are you a hoarder of cosmetics? Do you keep lots of extra towels. Now think about where those items will go in your bathroom. Choose a vanity that will hold all the items you need to store. 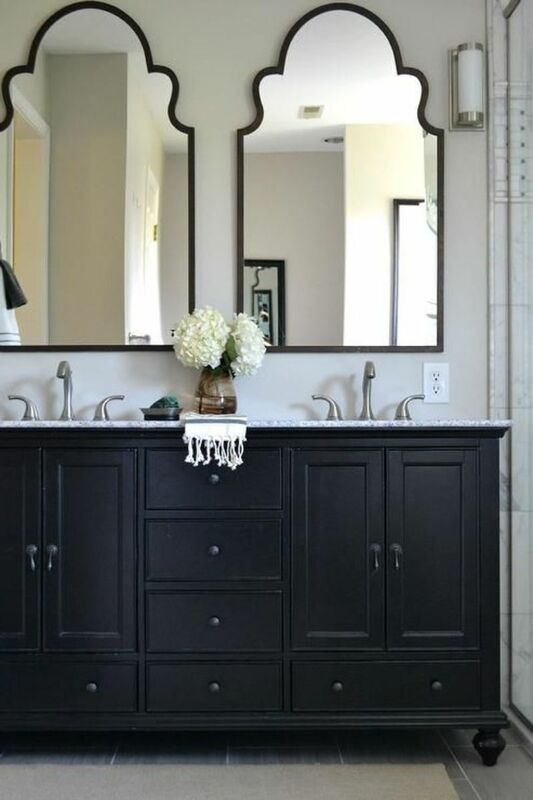 Do you need a double vanity with the center counter storage? Think it over. Then find the style you like.Don't buy a vanity with open shelving if you can't hotel fold a towel (their are YouTube videos that teach towel folding). Pictures 15 and 16 are very distinct styles. Keep it practical and clean. Vanities establish your bathroom style. For about $800 you could change out these vanities and completely change the look of the bathroom. Deciding on a painted or wood look vanity is a matter of taste, however going with current trends will date the bathroom faster. The current bathroom trend allows for the use of buffet style furniture as the bathroom counter/cabinet. Make sure you are not destroying expensive antique furniture. Also your counter should have sturdy construction. 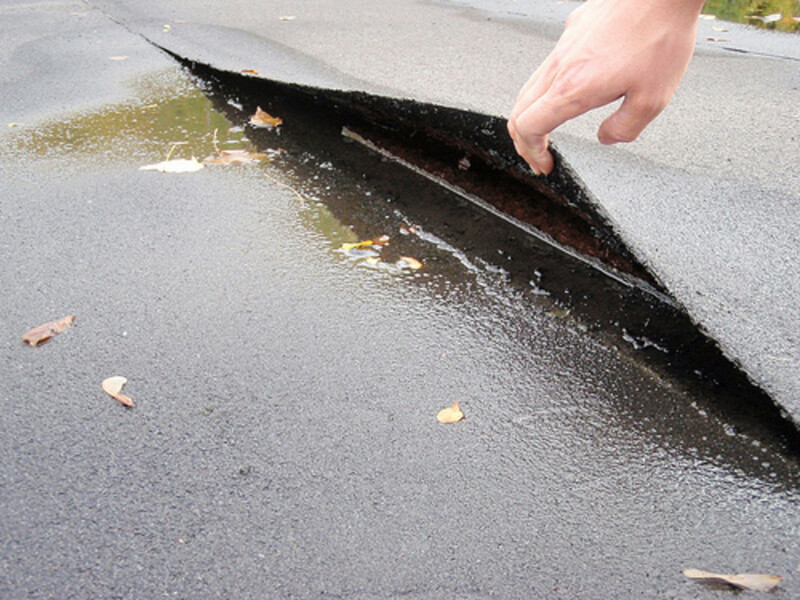 You will need to use a good sealer on any item you put in the bathroom to prevent moisture damage. If you are a chalk paint lover, do not use was to seal bathroom furniture. Instead use a sealer made for the bathroom and heavy use. two coats or more should make that surface cleanable. Here again, having an extreme style may date your bathroom faster than you intended. Speaking of extreme style, the vessel sinks are not going to make the cut. As cool as it looks today, tomorrow it will be a time marker for the 2000's. When you spend your money on a remodel, you want to know that the style will hold up. put your money where it matters to you most. 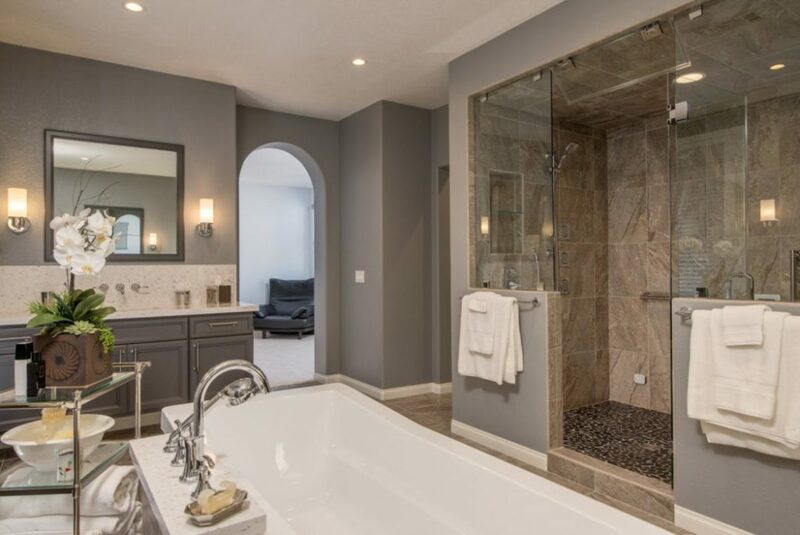 If you dream is the jetted tub or the tile shower, put the money into that part of the bathroom. Prioritize your remodel. That vessel sink may not be worth the expense. Also if you are determined to get these expensive elements, look for discounts and close out sales. These type of sales are great if you only need one sink. If you are on a tight renovation budget, consider adding details to your existing counter. Maybe what you need is to add some molding, paint and new doors. If your counter is in good shape you could save a lot of money by updating the existing counter. One last thought on the vanity, marble is beautiful but, the upkeep can be time consuming. Marble has to have a good seal to stay looking good. Investigate your materials, look for pictures on the internet of how these items wear over time. If you love something, it will work, That's the only real rule. 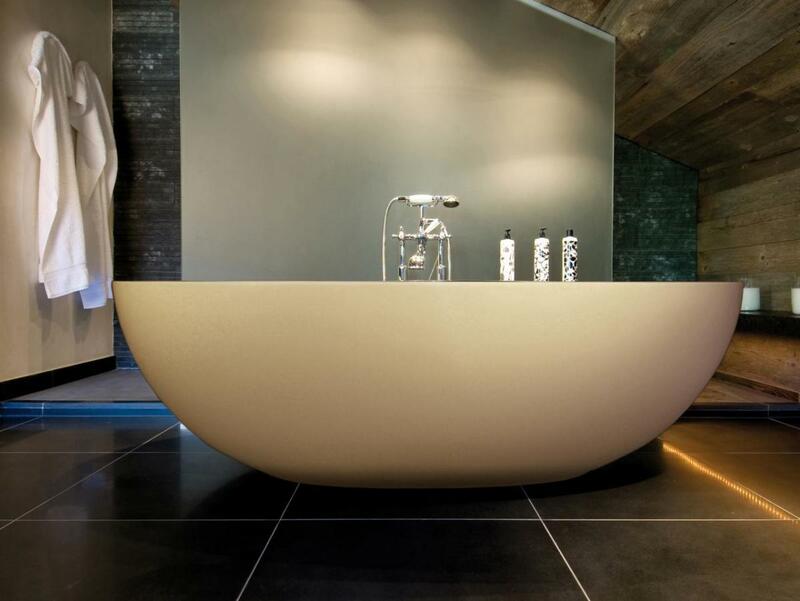 A new trend that is going to date your bathroom quickly is the bowl shaped stand alone tub.In most bathrooms it looks off. 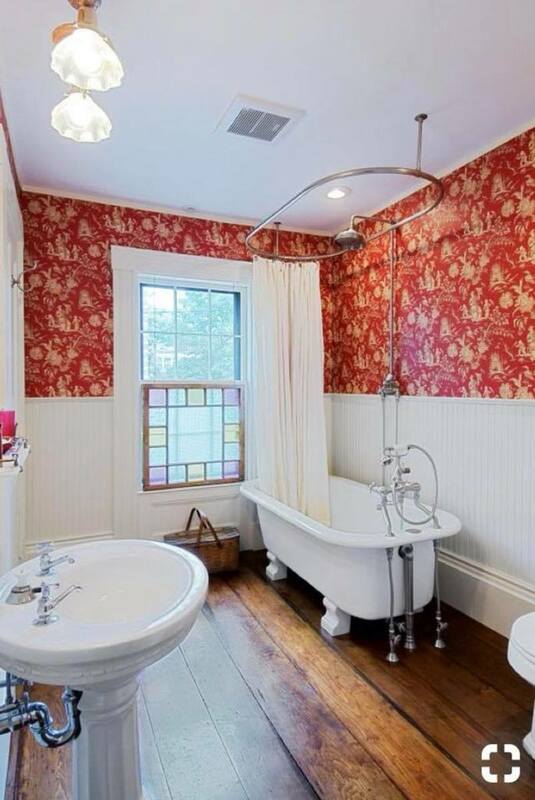 Even in this HGTV picture (picture 18), the tub looks like it's lonely. The stand alone tub is going date quickly. For some reason I can picture myself trying to get a mop between this tub and wall to clean, in this scenario I am frustrated and the end result is not as clean as I would like. I’m not sure how people are cleaning behind these. Where are they putting the shampoo? It looks like a spa, unfortunately it’s an extreme that will come and go. Hit the pass button on this tub, you will thank me later. In picture 18 we see the dark tile. This is one of the “new” styles. Using dark tile does give a stately feel, however it’s another design sham that will date your bathroom quickly. Dark tiles give off the feeling of being in the bat cave. This is an attempt at masculine bathroom decor. If you have a his and hers bathroom situation then this might be an option. Also I sort of feel like it is difficult to make your bathroom feel clean with dark tile. This tile might work if you have really high ceilings or a sky light. Use with caution. Black and White All Over! 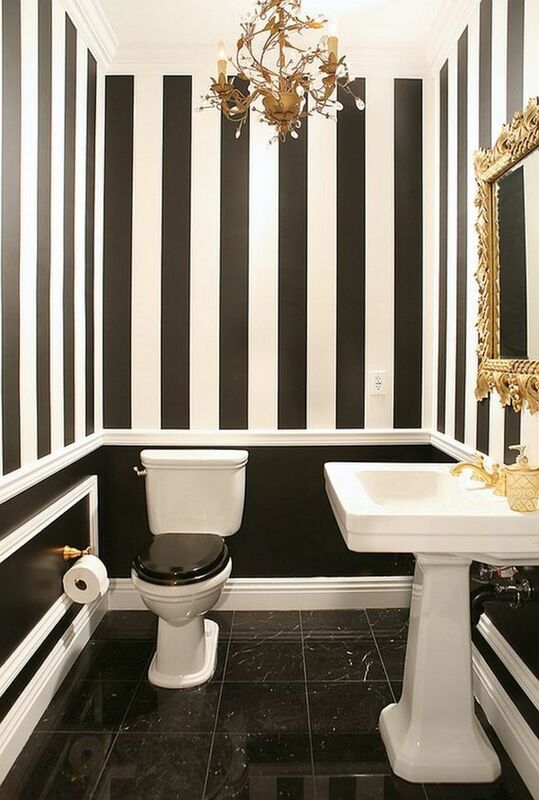 I was getting ready to wrap this article and I went looking for a black and white bathroom done correctly. I was instantly disappointed by picture 19 and 20. These two mistakes were so horrid that it forced me to add this section of the article to help you avoid these mistake. 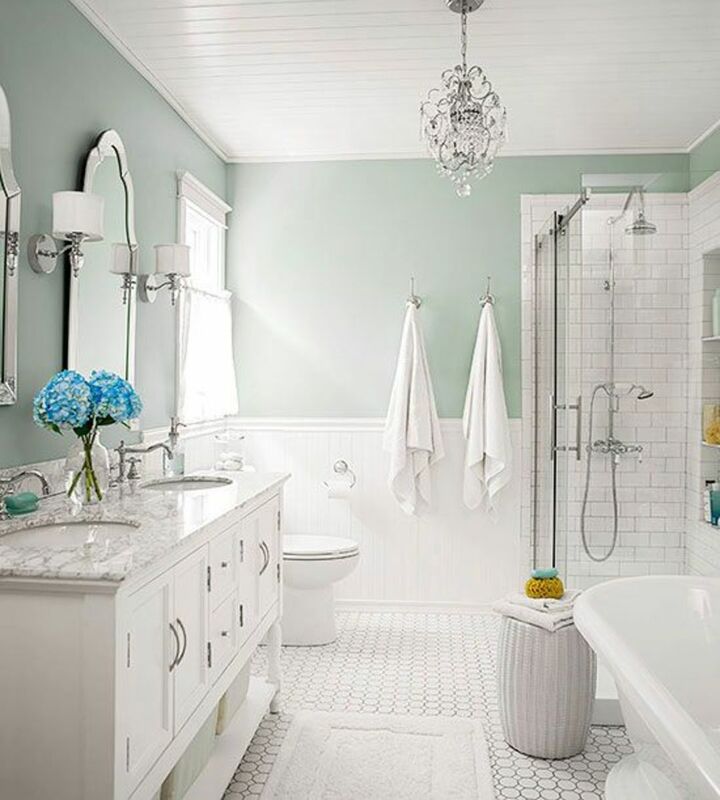 Picture 19 is of a bathroom that mixes styles. Those square vessel sinks look ridiculous in the same bathroom with a claw foot tub. Add the awkward tilted mirrors and what you have is a bathroom having an identity crisis. The solution is under mount sinks and flat mirrors, they were close to a great bathroom. Picture 20 makes me feel like I'm in a fun house. The hard part is that this bathroom is sooo close to being cute. What's throwing it off? the striped walls. A plain color would have been better. Be careful that you don't make your bathroom design comical rather than classy. This bathroom is a victim of a two color design that is over done. Even a damask wallpaper would have worked in this space. Art work might have broken up the cartoon feeling. It's hard to tell because, the stripes are glaring at you. Your home should be a reflection of you and what you love. Your home is not for other people, they are not going to live there. 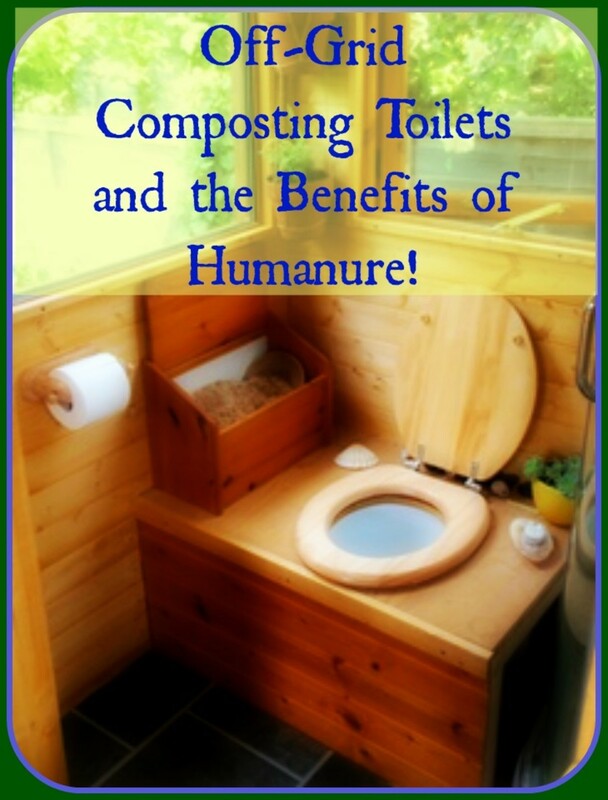 If you are considering replacing your toilet during this remodel, let me give you an idea. 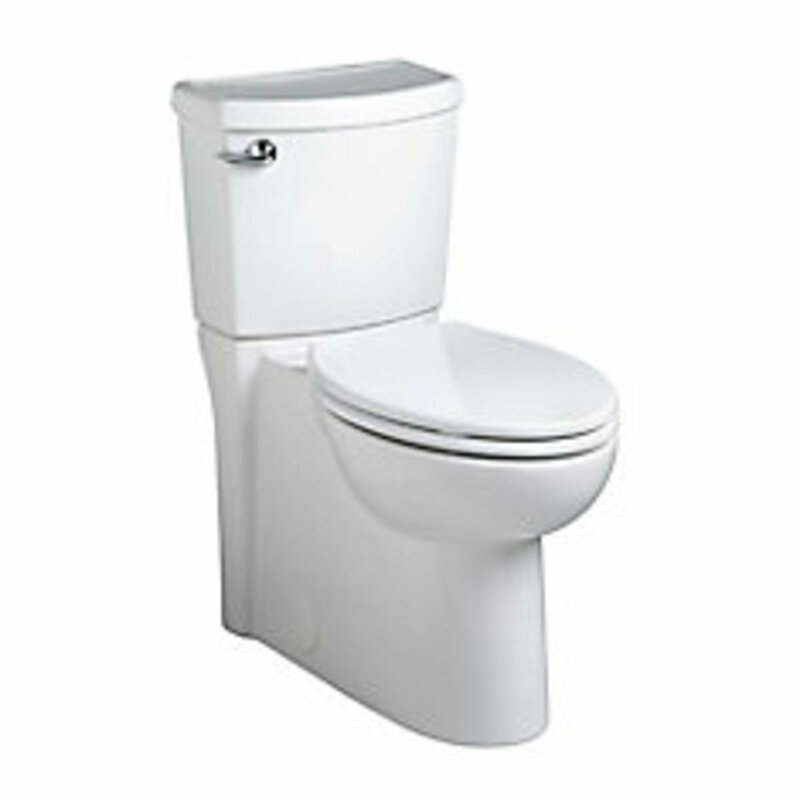 Picture 19 is a straight sided toilet. That's right women of the world, you saw it here first. No more trying to clean around weird angles. If it is possible to love a toilet design, I love this one. It comes in various sizes under a lot of fancy names, I'm sure it saves on water... blah blah blah. We really only care about the functionality and clean ability. Picture 22 is so intelligently done I might cry. 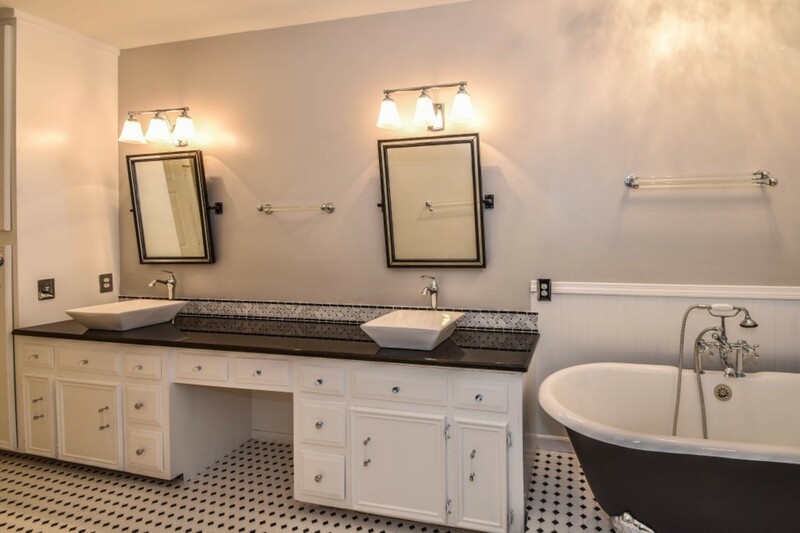 The gray walls could easily be another color to change the look of this remodeled bathroom. The shower is interesting and still gives an open feel even though it has the half walls. Good design works well in the lives of it's owner, this bathroom is going to hold up for a long time. Picture 23 gives you the feeling of a high end bathroom without being pretentious. This shower and tub draw you in and the tile pattern is amazing. Well done. Picture 24 is about the size of a normal hall bathroom. 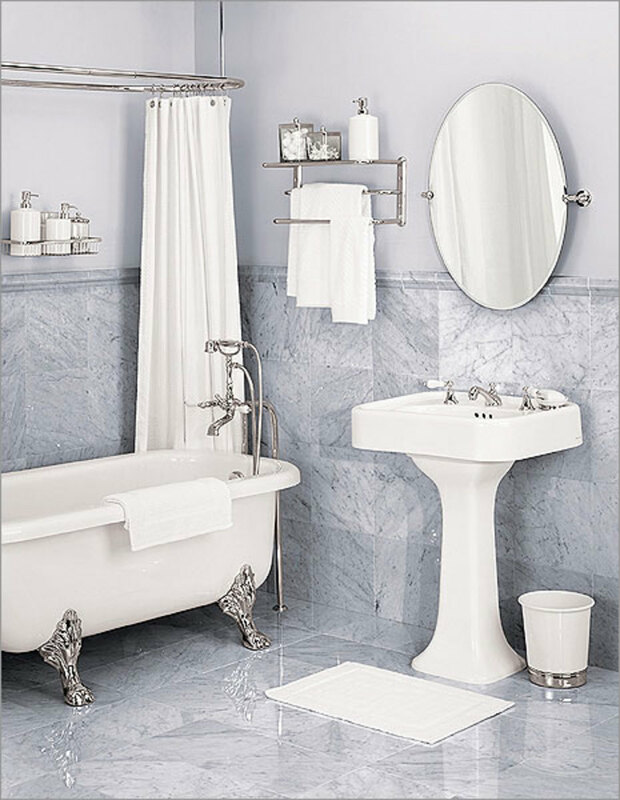 I chose this bathroom because it has a classic timeless design on both a budget and in a small space. The scale of everything in this bathroom is correct. Even though it's small it looks fantastic. The last picture is a modern bathroom (picture 25). Modern is not a style I personally gravitate toward. The reason is that in a bathroom, going modern tends to make your bathroom look like you stole the design from the local Benihana. Red tile or bold walls with sleek fixture may be your thing. Modern can feel cold. 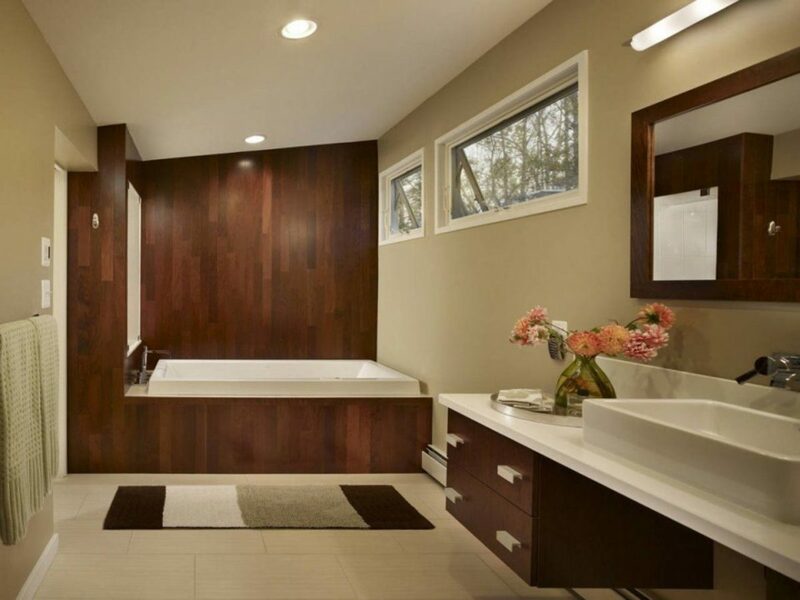 In picture 25 we see a modern bathroom that feels warm even though it has a modern look. Another thing that works in this bathroom is the floating counter with good storage space.The bathroom is beautiful. Choose wisely. Some of the costs associated with a remodel are expensive while others are moderate. Spent the money where it will count, make those items neutral so the bathroom style can be changed easily. Spend the money where it will matter the most. Don't put in a skylight and then skimp on your tile. Start with the basics and then if there is room in your budget you can throw in extras. Make sure your flooring is durable. 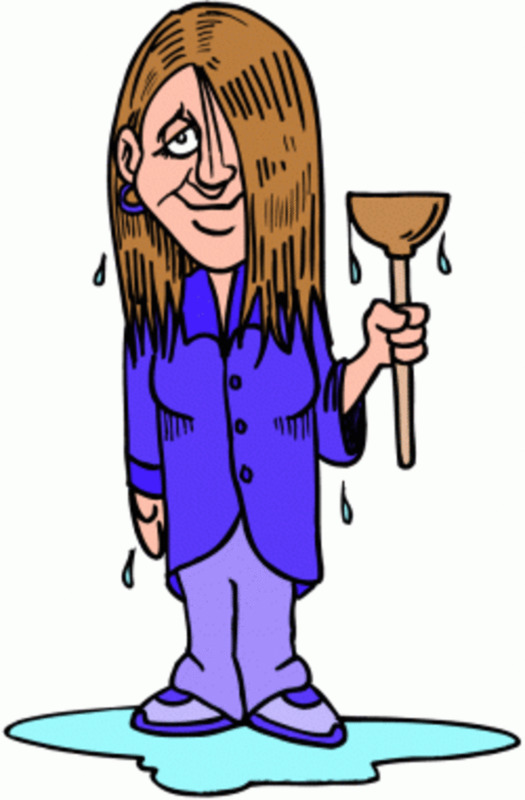 Products like carpet and laminate flooring will not hold up to water over time. At this point I'm thinking I should have written a book, maybe you are too. If you made it this far in the article, thank you for coming along. I hope your bathroom remodel is a huge success! I know what you mean, in some stores the lighting is so bad I won’t buy clothing because it looks awful next to my skin. I grew up in a 100' mobile home with the family of five. There was the place where the lighting in the bathroom was most beneficial for seeing true colors and hues in your skin or for the ladies' makeup. I don't miss the confines but I sure miss the lighting. I have lived in so many places since my adulthood and never have I had that small luxury? no not sure it's a luxury, maybe a necessity. Well, I'm not complaining just observing. My apartment now is spacious and well lighted (the room) but that specific mirror and angle of lighting are still missing. That cheaply made mobile home still lingers as a wonderful standard. If I ever move into a home of my own again (not likely) I will have to be insistent and try to find just the right lighting. Look at all this comment, all over a light bulb beside a mirror. hahaha. I found your article fascinating, especially as we were discussing bathroom update options today. Each time I stay in a modern hotel, the contrast with my dated bathrooms at home makes me think of an update. But I have yet to get past fhe thinking atage. This is a good article that carefully explains the choices to make with bathrooms. We recently did some upgrading, and I am happy to say we bought the right tile. I am fairly conservative with my choices, thank goodness we did not make any horrid mistakes!